If you’ve looked at the Facebook app on your phone today, you may have noticed a different layout in your photos section. Facebook quietly rolled out a new photo collage view to its iOS and Android apps on Thursday, so instead of seeing photos laid out as a uniform grid, photos with the most likes are highlighted and displayed a bit larger. Photos with the most likes get the all-star treatment with this new design tweak. 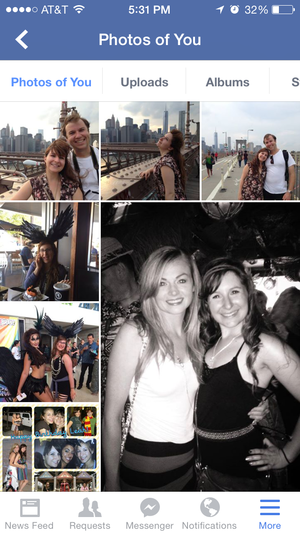 This collage look appears on your own photo page, as well as when you look at your friends’ photos. Photos are broken down into four tabs—photos of you (or your friend), uploads, albums, and synced—and photos of you and uploads get the collage treatment. Not only is this new layout visually interesting, it also showcases your best photos. So, in theory, your so-so selfies and brunch photos will step back and make room for your killer vacation photos. You can’t control which of your photos get highlighted, so it’s up to your friends and followers to curate your collection—via likes, of course. Facebook is still arguably the most popular place to share photos with friends, so switching up the photo page on mobile devices to showcase favorite photos makes sense—especially as our smartphones get larger and larger. The collage view of photos on my iPhone 6 Plus looks stellar, allowing the best photos of the bunch to shine through. Facebook also introduced a new login procedure, which lets you tap on your profile picture to access your account or enable a 4-digit passcode. After you’ve logged into Facebook on your iPhone for the first time, you can skip that step in future logins by enabling either one of those alternate logins. These features were rolled out to iOS devices automatically—no app update required—so launch Facebook to check it out yourself.